Annual Fiestas and Traditions in Fuente Álamo. With it´s history as both an important agricultural centre and also watering point for transhumance shepherds, Fuente Álamo became an established focal point for livestock trading. Since the middle of the 19th century, it has hosted an important livestock fair, and to this day provides a focal point for the annual livestock sales which take place at the beginning of June. 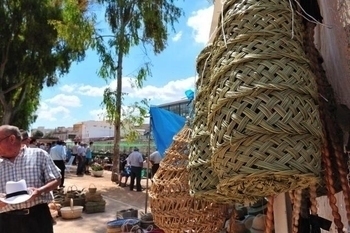 Most of the Feria centres around the sale of horses and donkeys, with a small number of sheep and goats also on offer. The feria is accompanied by a marquee for refreshments and entertainments and there are also pony and carriage rides on offer as well. Fiestas Patronales in honour of San Agustín. The Patron Saint´s day of San Agustín is the 28th August, and these Fiestas last for 2 weeks around this date, depending on which day it falls in the calendar. These are major Fiestas, and include a wide range of sporting and social activities, with concerts, dances, live music, folk festival, fancy dress competition, various competitions and parades. Fiestas patronales in Las Palas are celebrated in honour of San Pedro Apostól, which falls on 29th June. The fiestas are celebrated for 2 weeks around this date, and have a wide range of activities including Día Rociero with giant paella, motorbike encuentro and a number of sociable dances and entertainments. La Pinilla celebrates its Fiestas patronales in honour of the Virgen de la Luz, the main Saints day being the 8th September. At the beginning of May the village also celebrates the Romería de Los Cabecicos, in which the Virgen is carried up to the little sanctuary erected in her honour on the hillside behind the village. Cuevas de Reyllo celebrates its Fiestas patronales in honour of Nuestra Señora del Rosario, the main day for this being the 7th October, although there are a wide programme of activities either side of the main patrons day. El Estrecho de Fuente Álamo. The main Fiestas in El Estrecho honour the Santa Cruz, so are held around the 3rd May. On the 3rd, a procession takes place with the Santa Cruz, and throughout the days surrounding the main day, there are a number of activities including parade of floats and carriages, motorbike encuentro, dances and community activities. The Fiestas patronales of Balsapintada are held in honour of Santiago Apostól, and are held throughout a 2 week period of July, focusing around the Saint´s day on the 25th July. These are quite significant fiestas, with high quality dances and live music shows, and a large programme of entertainments for all the community. One of the most important days for the locals is the Día del camionero, the lorry driver´s day, celebrating one of the most important industries in the area- haulage. Other important days in Balsapintada are the 6th January, when locals perform an Auto de los Reyes Magos, a nativity play, and also the day of La Virgen de la Purísima. El Escobar de Fuente Álamo. El Escobar celebrates its Fiestas in honour of San Juan Bautista, St Johnthe Baptist, which fall in the second to last week of June. Each year on the 27th December, El Escobar hosts a Fiesta de Cuadrillas, which is a gathering of the musical Cuadrillas who perform at the religious celebrations across the region. First of all a musical mass is celebrated in the church, followed by the Cuadrillas performing in the streets. The Cuadrillas can "pedir el aguinaldo" from the neighbours,l which is a traditional way of raising money for the church, akin to our own practise of carol singing. Traditionally a "baile de pujas" was also celebrated , a dance of the fleas, in which the male members of the community would pay a sum of money to be able to dance with whichever female they chose, all the money going to the church funds. In El Escobar an Auto of the Three Kings is also celebrated in the evening of the 5th January, following which the neighbours gather to share food and exchange gifts. San Francisco de Asis is the patron saint of Los Cánovas, and the fiestas patronales are celebrated around the Saint´s day of 4th October. 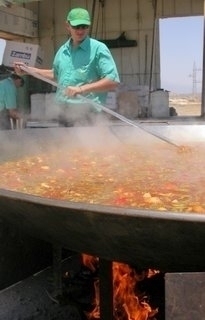 The community celebrates a mixed programme of activities, with several events based around local gastronomic traditions, including Migas making competition, paellas, and other activities based around michorones and tortillas.